Hiking is fun! The exhilaration you feel when seeing something naturally beautiful on a wilderness hike can occasionally be overwhelming. I vividly recall the very first mountain I climbed. It was Mt Roland in Tasmania's north, near Sheffield, and I had very little hiking experience. I did enough research to know where to drive, where to commence my walk, and even purchased a map from a hiking store to take with me. I was slower than most people walking uphill, but I was determined, and when I eventually reached the very top of the mountain, I was greeted by the most incredible view. It was sensational, like nothing I had seen previously, and I immediately wanted to see more of Tasmania. I was so incredibly sore, and I still had to walk my way back down, but I felt unstoppable. I caught the hiking bug! Waterfalls became a passion for me when my mother passed away. It was a single photo of her cheekily smiling standing in front of Russell Falls that made me want to experience what she had experienced. In my grief, that photo of my mum inspired me to visit waterfalls. It still drives me today. I spent countless hours researching on the internet where waterfalls were. I trawled quite a few websites to find information about where I should go to visit the waterfalls and how to reach them. And one by one I set out to these places. My excitement often turned to dismay when I learned a lot of the information I had found was not accurate, often not the fault of the author of the website, but because it was simply out of date. For some waterfalls, such as Cuckoo Falls in Tasmania's north east, it was once a leisurely stroll to reach it. Due to landslides in the area, it's almost inaccessible now, and certainly takes a lot longer to reach than an old website article suggests. In another case, I found GPS Coordinates of a waterfall on a website, and I planned a road-trip to it. I spent hours driving to the location, and then more time walking when I soon realised there was no waterfall at all. It turned out the GPS coordinates that someone had posted online were incorrect by nearly 200 kms. I'm a Software Developer by trade, having studied Information Technology at university. One of the core subjects I studied concentrated on Information and Data and the importance to have credible and complete information available. What was incredibly interesting in the course was it demonstrated how it was necessary for people to have as much information as possible in order to facilitate better decision making. For example, if the medical industry did not openly share ground breaking research about diseases for other researchers to learn from, what would the state of our health care be now? If the Agriculture Industry did not share its research on how to fertilise the land correctly, how to irrigate correctly, or how to farm more efficiently, would we have a massive shortage of food on earth? If the Police Force did not develop and share techniques for Crime Investigation, would we have more crime? If First Aid treatment was not taught and shared to people, how many people would have lost their lives? What has improved the lives for many people on earth is the knowledge we've gained and our understanding of it. The "Dark Ages", a period spanning hundreds of years where much of society was deliberately kept illiterate is a testament to how development and progress becomes stagnant when information is suppressed. In a much less severe way, not having enough information will lead to mistakes. This is where I mention some of my mistakes, and how being equipped with more information would have helped me. When I researched where waterfalls were and how to get to them, I relied very heavily on the information I found on the internet as well as information people had told me. I also relied heavily on my own interpretations of the information I found, and my understanding of law. One of the biggest issues I have faced is not having all the facts. One instance, I visited a waterfall that was located right next to a road. I had researched where it was but didn't find too much information about it. I purchased a Tasmap of the area, and located the waterfall on the map. So, one afternoon I drove to the location, parked my car on the side of the road and ventured down to the waterfall. I posted a photo of it but was then informed that the waterfall was on Private Property. At the time, I was quite confused about it. The waterfall was quite literally right next to the road and had huge Power Lines crossing nearby. My understanding at the time was public infrastructure such as powerlines had several metres of crown land either side of it. I was also under the impression that the banks of creeks and rivers were crown land too. In all of my understandings and interpretations I was incorrect. 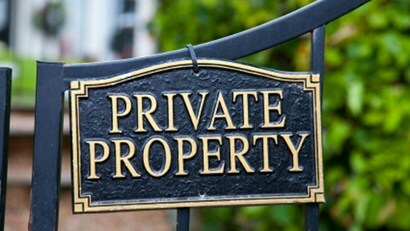 it was indeed private property, completely! It is not accessible for the general public. I had accidentally trespassed. Topographical map showing a waterfall. But is it on public land? Ultimately, the mistake is mine. People will argue that 'ignorance' is not an excuse. But, I cannot help but not agree with it, especially when I did spend hours researching many of these waterfalls. Why is it so incredibly difficult in Tasmania to find credible, accurate, and complete information about places to hike? Why is it necessary to spend days researching just to find information about a place? Why is Tasmania in the dark ages when it comes to letting people know about the resources available for people to use? The saddest thing for me was in a community like the Waterfalls of Tasmania facebook group there are people who know about these resources but were reluctant to share it for whatever reason. Generally, there are people who truly believe it's best not to share information with other explorers. This leaves the 'ignorant' in a precarious situation. People are only ever going to be as good as the information they have, and when there are gaps in their knowledge they will fill those gaps with what they perceive is correct. I don't believe it's an individual's fault when they make a mistake. I think it's a fault of society when it could help equip people with good information so people can make sound choices. There are quite a few waterfalls that are located on Private Property, some of which are listed on this website. A healthy debate does occur from time to time about whether those private property waterfalls should be on the Waterfalls of Tasmania website. So, why do we list those waterfalls? Isn't it just promoting those waterfalls? The short answer is No, it is not promoting those waterfalls. If I actively posted on Facebook that people should visit a waterfall on private property then yes it would be 'promoting'. We do not do that. Whenever there is a waterfall that is listed on Tasmaps, and/or is registered with the Tasmanian Nomenclature Board, it will appear on the Waterfalls of Tasmania website. The reason for this is so people can find some information about that waterfall that they may have trouble finding. The information about these waterfalls are already online across various different websites, including Government websites and resources. It's not necessarily new information. However what our website does provide is a resource where each waterfall has a tidy place that people can use as a foundation for more research if they need to investigate further. The information on the Waterfalls of Tasmania website is collated by volunteers and if you see any information that needs correcting or updating, please send us a polite message.